Streetwear designer Heron Preston has designed a NASA logotype collection in celebration of the space agency's 60 years. Five years after first emailing NASA about designing spacesuits, streetwear designer Heron Preston is a step closer to fashion's final frontier. 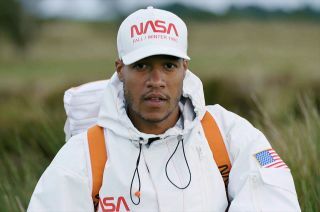 Preston, who has worked with Nike and Kanye West, said in a 2013 interview with The New York Times that his dream collaboration was with NASA. He has now launched an outerwear line that takes cues from the space agency's visual history on its 60th anniversary. "I think one of the first exciting moments of working with NASA was just getting a reply that they were open to doing to the project with me," said Preston in a video released with his new collection. "There were a lot of color guidelines I had to follow, a lot of copy I had to follow," said Preston, referring to the rules NASA established in 2017 for the reintroduction of the "worm" on commercial apparel and merchandise. Heron Preston's NASA logo cap and jacket fly 32 miles above Earth on a weather balloon-lofted journey. The space agency's rules restricted reproduction of the worm to red, gray, white or black print and it could not be outlined or appear inside another logo or shape. Preston even went beyond NASA's own concerns by placing his creations into the proper timeline. "This is the Fall/Winter 2018 collection, but it says 'Fall/Winter 1990' in respect to the actual time that the logo was actually used," Preston explained. "1990 was one of the last years they could use the 'N-A-S-A' logo." "The National Aeronautics and Space Administration is an independent agency of the executive branch of the United States federal government responsible for the civilian space program, as well as aeronautical aerospace research." The collection, which went on sale on Preston's website and at fashion retailers on Friday (July 27), also includes a silver denim jacket reminiscent of the silvery pressure suits worn by the original Mercury astronauts, NASA-worm emblazoned socks and belt, and a backpack styled after the portable life support system worn by Apollo and later astronauts. "I designed the entire collection based on their spacesuits and so I did a bunch of research," said Preston. "These guys are going up to space to push humanity into the future." "You have to move around a lot, you have to be able to hold tools, and so that is why the bag is designed to be multi-convertible, multi-functional into three parts," he added. "It is a tote bag, the fanny pack and then it is also a backpack — all in one. And it is designed in the shape of a square, which is just like the backpacks that astronauts wear when they do spacewalks." The backpack, which as of Sunday (July 29) was sold out, retailed for $1,342. The other items range from $85 for the socks to $1,897 for a white "NASA Tech" parka. Heron Preston's NASA-inspired backpack can be worn as shown or used as a tote bag and fanny pack. To promote the capsule, Preston and producer David Laven premiered "Above the Clouds," a short film that culminates in the designer sending some of the new NASA logo-emblazoned apparel on a weather balloon-lofted flight to 32 miles (50 kilometers) above Earth. "The original dream was to shoot this literally on the International Space Station, styled on a real astronaut. I feel like this is one step closer to that," Preston said in the film. Though this is not the first time a fashion designer has taken cues from the space program, the theme is still uncommon. "Working with NASA, the real agency that have sent people to space, to have sent people to the moon, that explores planets, this is as real as it can get. That is what I'm using my platform for, to tell other stories that you don't really hear in fashion," said Preston. See more of Heron Preston's NASA capsule and watch his short film "Above the Clouds" at collectSPACE.